This product contains three of our best-selling alphabet/letter products in one: Alphabet Memory, Alphabet Mini-Books, and Handwriting Practice! Over 150 pages of useful materials provided! 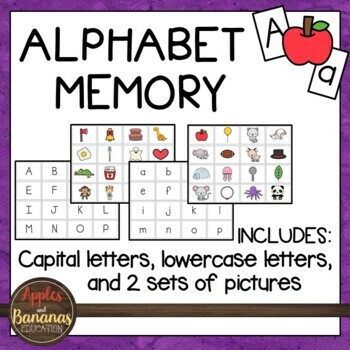 These alphabet memory cards can be used as part of memory game, as a pocket chart activity, or as part of a center. There are so many uses for these cards, whether your students are working on capital letters, lower case letters, or letter sounds. You can choose when and how to introduce each letter form to your students. Activities can easily be differentiated to meet the needs of all learners. 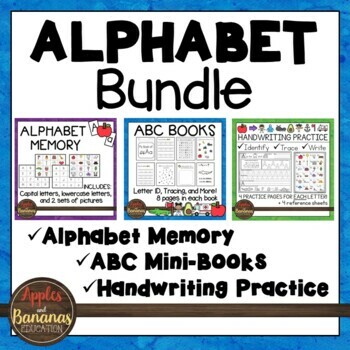 The mini-alphabet books (A-Z) give students a fun way to learn how to identify and write their upper and lower-case letters and appeal to all types of learners. Our students love the feeling of accomplishment they get from completing each mini-book. Each book is jam-packed with skills early learners need, but because each page is short and sweet, students won't feel like they are doing tedious "work". Great for classwork, homework, centers, and more! Each book has 8 pages and can be printed back-to-back to save on paper. 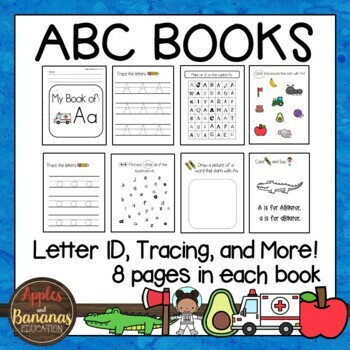 You can also laminate these books for a fun center activity. 8. Color and read a simple sentence to reinforce the letter and sound. 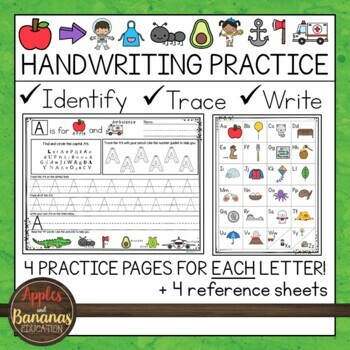 Young students will recognize, trace, and write letters using a fun and interactive format. Use these full-color sheets as a learning center with page protectors or overhead sheets. The entire packet is also available in black and white! Pictures are used to correspond to each letter to encourage letter/sound correspondence. Students will distinguish letters when written in different fonts. Four pages are provided for each letter of the alphabet - over 100 pages of handwriting practice! **Printing note for all products - when printing, be sure to choose the "Advanced" option from printer settings and "Print as Image."